I wrote to the Austin Chronicle a couple of weeks back to follow-up on their quote of the week, from departing Austin Mayor Lee Leffingwell. So, our rail or fail Mayor Leffingwell reminds us that there are some 860,000 people in Austin, and it’s hard to remember that when confronted by 200 loud voices in the chamber [“Quote of the Week,” News, Jan. 9]. Perhaps if he’d been more of a leader, less confrontational, and paid more attention to the issues of those various 200 people, he’d have been elected in 2012 by more than a paltry 10% of Austin voters. Voter apathy in Austin is legend, and you get what you vote for. Fellow Austin rail advocate, Andrew Clements followed up my letter aka “piled on” in a follow-up letter, it’s a much better summary of the Leffingwell era, or “legacy” . Irrespective of f the rail bond passes today, this is where I’d be spending money in the next few years, make a serious attempt of creating an inclusive, flexible work hours business environment and it won’t cost $1.4 billion. 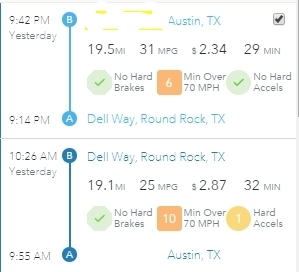 So, Austin traffic is terrible, lots of reports hightlight Austin as having the 4th worst traffic in America, especially those advocating for the road/rail on being voted on today. However, if you sit down and do the numbers, what you’ll see is apart from I35, which I’ll come back to in a later post, almost none of the roads are at or near capacity. 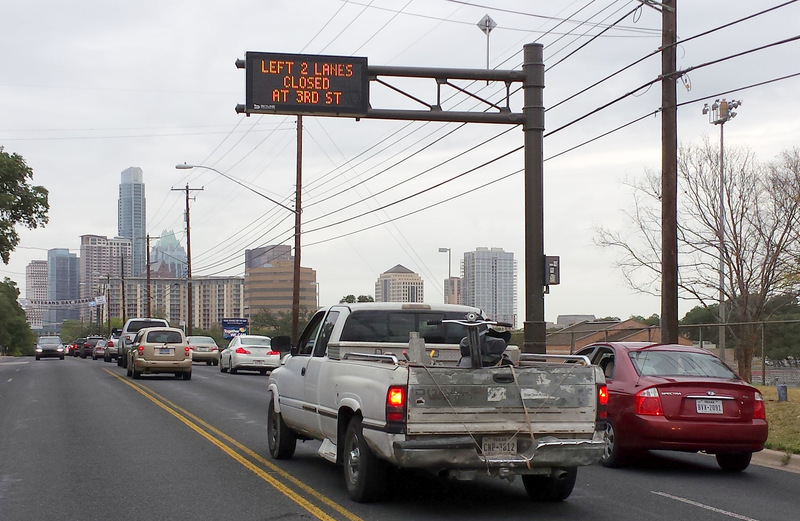 What Austin has, in a commuter traffic problem. This matches exactly my anecdotal experiences. I took this picture this morning after my run. The traffic wasn’t there at 7:15 a.m. an it was gone a 9:15 a.m. South 1st was blocked all the way from City Hall, to up past W Oltorf. I’m sure the same would have been true on North and South Lamar; South Congress, Mopac, I35, East Riverside et al. This is key when it comes to today’s vote on the rail and road bond. If you vote for the bond, what you are in essence be approving is a route that is a hail mary pass where we have to see significant growth to give the trains any real passengers outside of commute time. Even at commute time it’s not entirely clear that the ridership will meet the targets that Project Connect have claimed will be achieved. This is why route selection is vital. On Sunday I was cycling up on Parmer Lane. I had to stop where the Red Line aka Metrorail crosses Parmer just west of R620. As the train passed, I strained to see the passengers, there were none. Even if the current proposal passes, this is likely to be a regular scene, since for the most part, apart from the medical buildings, the train doesn’t go where anyone will want to go during the day, unless the growth comes with the train. If the route doesn’t get the riders, isn’t seen as a viable benefit to the city for the cost, it is highly unlikely that other bonds will be approved off the back of what will be seen as another expensive rail project. The route isn’t going to reduce congestion at commute time, it will simply encourage more growth and more sprawl. Julio Gonzalez Altamirano has a great summary of all the issues, but even he, along with both the proponents and critics have not discussed or talked about is the cultural issue of commuting at the same time. Austin, Texas embodies an almost macho, work at all costs, be in early culture. It may not represent Texas, but it’s much worse here than almost anywhere else that I’ve worked(London, New York, Moscow, Berlin, Beijing). We are in the middle of the country, so we have timezone drift from both the east coast and the west coast. It’s not unusual to have calls at 7 a.m., meetings regularly start at 8 a.m. That has a massive impact on families, getting kids to school, getting to work. Lately I’ve been tracking my commute times. I live in the central downtown and work in Round Rock, a 20-mile drive. I try to work at home Fridays, and every now and again I bike home from work and then the next day, bike back. Over the past month, whenever I can I’ve been leaving my drive to work until after 9:30 a.m. I have been using the AUTOMATIC driving app for a year or so, it makes it easy to look at your driving, trips, times and speed etc. Trying to get out of my road anytime after 7:30 a.m. gets difficult, the traffic is streaming 2-lanes north towards downtown. It stays that way until 9 a.m. or so. The reverse is true in the evening. Getting through downtown, a distance of just 2-miles can add 8-minutes to my commute time. However, if I leave outside the peak commute times, I can easily make it to work in less than 30-minutes, because apart from the downtown commute there really isn’t any traffic, even on I35, unless you are coming south from Pfllugerville, Round Rock and further afield. It would seem to me, tackling this wouldn’t be free, but encouraging flexible working would be a great start. Sure, lots of businesses like schools, restaurants and other service based organizations need to have set hours staffed, and can’t have everyone show up at 9:15, but even they can be more flexible at setting roster times. Flexible working has a large number of direct benefits, but also avoids the roads becoming clogged up all the time, with the noise, smell and cost associated with that. Even if you could extend the commute by just 45-minutes it would significantly reduce the actual congestion. For the individual, it comes with a load of benefits, with flexible work schedules, employers also get a significant benefit. But when it come down to it, flexible working is about trust. Are Austin businesses ready to trust and encourage employees? And are Austinites prepared to shift their schedules? Irrespective of if the rail bond passes today, this is where I’d be spending money in the next few years, make a serious attempt of creating an inclusive, flexible work hours business environment and it won’t cost $1.4 billion. Tomorrow is voting day for Texas and Austin, there is some excitement over the new 10 district system in Austin among the political classes, but not much among the voters. One of the big issues, at least for me and the general media has been the traffic, and more specifically congestion. Up for vote is Prop-1. a mixed rail and roads bond with a cost of $1.4 billion. It has become a total political football, although either way it is a win/win for the urbanists who either get rail and can pursue density; or don’t get rail and can use that to drive calls for faster and more density. I’ve posted numerous times on the rail topic, but just lately I’ve been tracking my commute times. I live in the central downtown and work in Round Rock, a 20-mile drive. I try to work at home Fridays, and every now and again I bike home from work and then the next day, bike back. What at least for me has become obvious over the last month, is that yes, Austin has heavy traffic from time to time, but really it doesn’t have a traffic problem, it has a commute problem. There is a better choice and it’s worth the wait, Austin’s strongest and densest corridor: Guadalupe-North Lamar.. Communities want light rail on that route and have written it into the neighborhood plans. 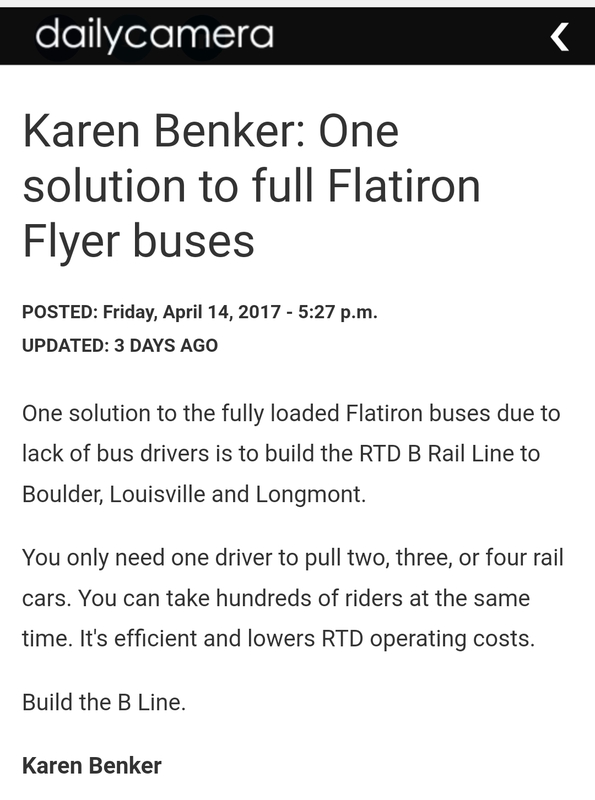 The FTA has said it would consider funding a MetroRapid bus-to-light rail conversion in that corridor. From where I see it, this was never about rail, it was always about developing an under-developed corridor of central Austin. A previously undesirable corridor because of it’s proximity to I35 and the noise and congestion associate, along with specific properties, which, without rail wouldn’t be nearly as viable or valuable. One reason I have not posted to my blog recently is the fact I’ve been spending my time lobbying, writing an posting on why this is the wrong solution. Since my last blog a lot of additional material and discussion has happened. Also, long overdue I’ve joined AURA, a number of their members have produced some great information. I was also impressed with Roger Cauvins’ calm, logical argument at the recent KUT Views and Brews. You can hear the whole Views and Brews here. 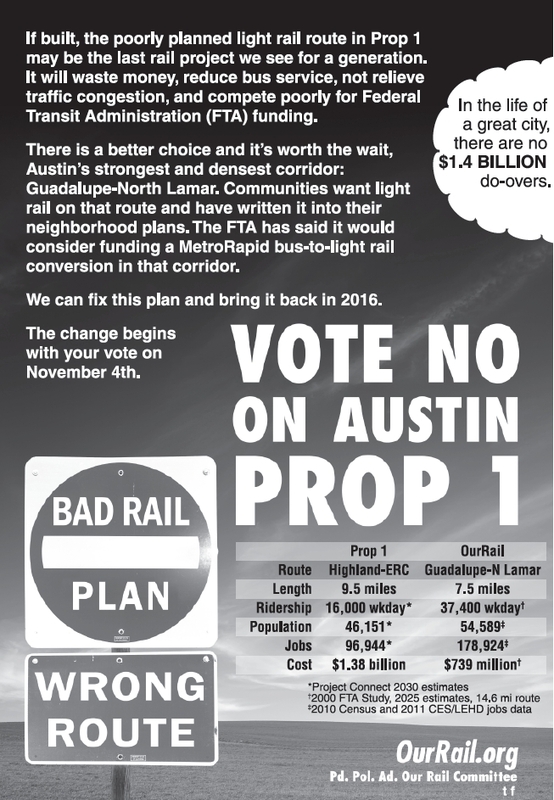 From where I sit, this was never about rail, it was always about developing an under-developed corridor of central Austin. A previously undesirable corridor because of it’s proximity to I35 and the noise and associated congestion, along with specific properties, which, without rail wouldn’t be nearly as viable or valuable. An AURA blog post nails where the funding for much of the pro prop-1 support is coming from, and by doing so also confirms what I thought, and had previously heard about the route for the rail in Prop-1. It’s also well worth listening or watching the following City of Austin Central Corridor Advisory Group. For those that are short of time, use the menu to skip to the citizens communication section and listen to the first speaker, Mike Dahmus. Having been surprised by the direction and format of the meeting, that basically rubber stamped the route, Mike discussed what was wrong with the selection and the proposal. If you can, continue to listen through the Mueller developers, to Linden Henry and David Dobbs, possibly the two qualified people in Austin on transport. If you can’t be bothered to listen, Mike has written this elsewhere on the Prop-1 rail proposal. Project Connect has ignored public input in favor of misrepresentation and obfuscation to justify the predetermined route preference of UT and speculative development interests. Please don’t fall for the premise that this somehow represents good transit planning; so far, most knowledgeable Austin transit activists oppose the plan, and every national transit advocate/expert who has spoken up about it has been amazed at how badly the process was run and how stupid the recommended plan is. Prop-1 route was decided and heavily influenced by developers, and then a justification sought. It’s easy to see that those in the urban sprawl areas, will vote against this because they’d never use it, and will add circa $300 per year to their property taxes yet many of them commute into the central business district.Meanwhile, those, especially long term residents in the central districts, Zilker, Bouldin, Travis Heights etc. who have seen huge property tax increases as the property value increased, face another $400 per year for a system they can’t use and for which for the most part won’t help with traffic congestion. It’s worth remembering that unless you die, or move out, an improved property value is worth zero, nothing, nada. However, the tax burden is real. The elderly, retired and those barely surviving now due to increased costs, will now be further penalized by the increased taxes which are proportionately much higher, due to their higher per sq foot property value, which will ultimately force more people to sell their properties and move out, further gentrifying those neighborhoods.